“The Heart of Healing lies in our ability to listen, to perceive, more than in our application of technique.” Thomas W. Myers page 2, Anatomy Trains, 2nd Edition. Reading this statement got me to thinking about my own struggles and how much more could be achieved by not letting my ego get in the way of somebody else’s healing and becoming more of a willing participant in the empowerment of balance and awareness with myself and for my clients. If you would have told me eight years ago that my path would lead to go to massage school to try and change my life from being in dead end jobs and on the verge of complete collapse for 15 years prior. Just on the notion I could possibly make lots of money, more than I had ever had by becoming a massage therapist, only to struggle frantically for another three years after school. Leaving my beloved Oregon to move to Arizona to start over, I probably would not have listened or just ignored you and that has always seemed to be one of my shortcomings. Most of us want freedom and independence, or at least it looks good on those spirited commercials for massage therapy. But the fact of the matter is there must be a balance and awareness of ourselves, others, and our environment to achieve success or at least happiness within ourselves for what we are doing or want to do. When I finished massage school in 2004 at Ashmead College in Vancouver, Washington, our teachers taught us a balance of science and art in massage thus forging my creative process of touch and movement guided with science and intention. Then I immediately enrolled in an advanced course of clinical sports massage therapy with a Rolfer, Jeremy Sutton, who became a mentor in so many ways, opening my eyes and mind to the possibility of changing the rules of treating people with touch and ultimately setting me on my path by introducing our class to Tom Myers’ Anatomy Trains. Fast forward three years (2006-2007) living in Arizona in and out of dead end jobs. I lost my place to live, my car, and my dignity. Nothing seemed to change for me. I wasn’t even doing bodywork/massage. I was painting commercially and residentially. Though in my mind and thoughts, I wanted just to be a body worker, so I kept studying my anatomy and physiology. After seemingly losing it all again, it dawned on me that I still had a massage license and I told my business partner I was through with painting. I swallowed my pride and went to work at a corporate massage establishment, the very thing I wished to avoid in my massage career. But I was listening to the voice in my being. Remembering what Ashmead College and Jeremy Sutton taught me, I went to work integrating the two. The excitement to be around colleagues and putting the teaching and philosophy to practical use was a grand feeling. It was the happiest I had been in four years. I became very successful at this corporate establishment in a short period of time and I began to listen to that voice even more. Six months into my job, I bought the Anatomy Trains book and DVDs. I read, studied and put what I understood to practical use on clients. I went through so many changes as a massage therapist and, most importantly, as a person during this three year transformation into a structural integrator at this corporate massage environment. It was difficult at times to know who or what I was. Management and other therapists would try to define me, but it all came down to I work differently. One thing for sure though, the results that were being achieved for the clients were undeniable. 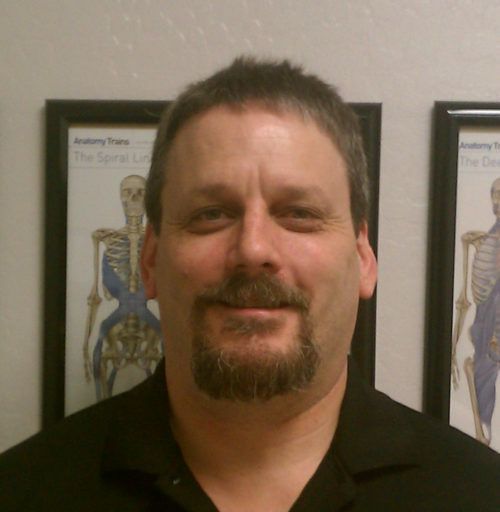 Ten months into my employment, it’s April 2008, and I register for my initial Anatomy Trains seminar in Clarkdale, Arizona, only to register for two more seminars within a two week period of immersing myself in 80 hours of continuing education during this time. After all this time, I understood what I was, a massage therapist with a structural integration mind-set. So I went back to work very inspired with the amount of clients growing every week. Then in February of 2009 I registered for the four-day Intensive Body Reading Seminar. After that course I made the decision to apply for the KMI 500 hour Certification Course, which was coming to Mesa, Arizona in November 2009. I graduated December 10, 2010 and couldn’t be more proud and honored to be practicing KMI Structural Integration. Going into that course, I was so excited about all the great techniques I was going to learn, but what I really was educated on was the Human Spirit and I grew up a little bit more in the process. In July 2011, I left the corporate massage business with lessons learned in hand and started working with a chiropractor who shares the vision of holistic healing, and I am officially a lifelong student of Structural Integration, Listening, Balance and Awareness through cooperation and movement.